A lot of homeowners, especially those who live in the city, have to contend with the ever growing problem of sound pollution. It can be the television right at the top of its volume level keeping the people in their bedrooms wide awake. It can be the sound of the garage door underneath your room creaking each time someone gets in or gets out. You do not have to put up with annoying, disturbing sounds all your life. You would be able to enjoy your time with your family at home the moment you have your walls soundproofed. With the right soundproofing material, there will be no more arguments over loud stereos and surround sound systems. Rock star wannabes can practice in the basement or in the garage without upsetting your dinner. Your home theatre system will sound better as you watch that old Bee Gees concert, if you have your room soundproofed. In general, your quality of life will be improved. Unless you reside high up in the mountains or in some remote area, noise pollution will always be a part of your life. But you can significantly reduce the effect of loud sound if you choose to soundproof your homes. Aside from the stereo and television, other contributors to blaring noise include loud neighbour conversations, the playing of musical instruments, and street traffic. These are just some of the most common types of noise that plague our homes and disturb us whenever we are trying to relax after a long day at work. It’s actually a form of invasion of our privacy. You can never feel alone when you hear the blaring noise right behind your walls. To get rid of the noisy racket, it’s time to soundproof your home. Aside from being a source of annoyance and trouble, health and environmental professionals claim that too much noise can actually lead to poor health. And that is why lately, a number of building contractors and real estate agents promote soundproofed apartments for investors. The goal of soundproofing is to enhance sound insulation not only between flats but also within the units themselves. Although ideal for shared properties including hotels, small apartments, and hostels, soundproofing offers a lot of benefits to residential properties. Today, a lot of homeowners contemplate on improving the sound quality inside their homes. Only after the installation of soundproofing products did they discover how bad sound quality impacted their overall quality of life. There are more than a dozen different ways to soundproof a particular room and each provides a different noise reducing function. 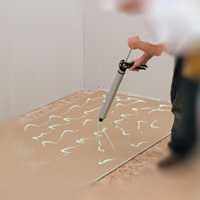 Basement soundproofing is a totally different project insulating your bedroom. If you have an old home, the first thing you need to do is get rid of your squeaky floors. Creepy footsteps can be very distracting to a lot of people. You can have them replaced or doubled up to prevent them from making a noise. But if you are planning on having insulation installed, you better have those boards replaced totally.